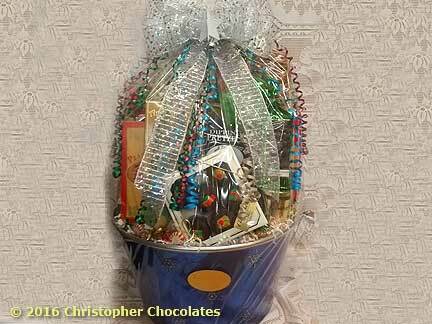 Welcome to the Elite Collection of Christopher Chocolates Premium Gourmet Gift Baskets. Please review our selection of Elite Gift Baskets featuring delicious gourmet snacks and candies plus other niceties in classy decorated gift packaging. If you are seeking Christmas and Various Holiday Baskets, you are in the right place. We are working to bring our collection of Holiday Baskets for online review. Please trust we have a great variety of baskets robust with delicious treats starting as low as $20 but available to satisfy any need and budget. 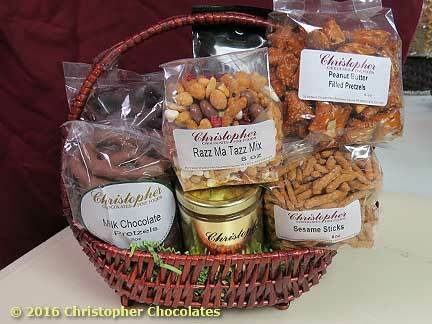 Christopher Chocolate Assortment, peanut brittle, dipping pretzels & mustard, and gourmet snacks. Perfect for all to enjoy! An assortment of nuts, peanut brittle, chocolate covered nuts, deluxe mixed nuts, plus more. If you know someone who is NUTS, this basket is for them! 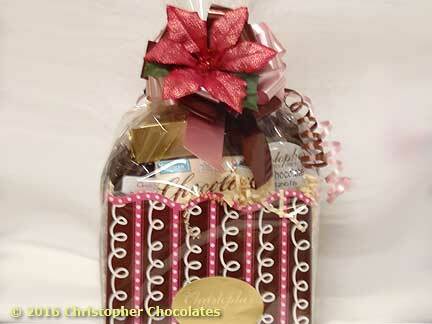 Gourmet coffee, tea and cocoa, scone mix, fruit preserves, and other yummy snacks made up in a decorated house box. Fudge, snacks, chocolates, candy slices, and other goodies. A simply sweet treat! Our Christopher Assortment, bridge mix, fudge, truffles, chocolate pretzels, chocolate chip cookies, and more. ALL Chocolate, all in one great big gold box. Milk and dark chocolate pretzels, dipping pretzels and dipping mustard, peanut butter pretzels and more pretzels. Chocolate pretzels, mini chocolate pretzels, cookies, snack mixes, gourmet popcorn, mixed nuts, cashews, snacks and candies. Enough munchies to say, “Thank You For Your Business” or “Happy Holidays”. No mixes, no fuss, just open and munch!